This definitive guide examines how to take advantage of the new Agile methodologies offered when using Ruby on Rails (RoR). You’ll quickly grasp the RoR methodology by focusing on the RoR development from the point of view of the beginner- to intermediate-level Microsoft developer. Plus, you’ll get a reliable roadmap for migrating your applications, skill set, and development processes to the newer, more agile programming platform that RoR offers. With its valuable combination of simplicity and productivity, Ruby on Rails is a portable, extendable, open source web application framework that quickly gained worldwide acclaim. 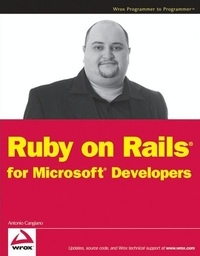 The aim of this book is to make the enticing Rails methodology more approachable for developers who are already familiar with Microsoft tools. After an overview and brief history of the framework, you’ll focus on learning Rails development from the point of view of a beginner-to-intermediate level Microsoft developer. The author explores all the fundamental aspects of Rails, and includes comparisons and references to Microsoft development tools that you may already be familiar with. In doing so, he provides you with an easier path to learn how Rails simplifies the design and implementation of web applications. By serving as a roadmap for migrating your skill set, development processes, and applications to the newer Agile programming platform that Rails offers, this book will help you leverage your existing skills so you can quickly take advantage of the full potential of Rails.